The poor banana. It gets so much bad press. High carb! High sugar! Many diets shun the banana. I get that it’s not the most exotic or exciting fruit. It might even be considered a little boring, especially with all the pomegranate, acai, mangosteen madness the past few years. I’ve always been against labeling foods as “super foods” so it’s no wonder that I don’t put bananas lower on the nutrition totem pole than any other fruit (does anyone really eat mangosteen anyway?!) I admit I also tend to root for the underdog, but the banana really has a lot going for it. Sure it’s not a glamorous fruit, but there is still so much to love. I have to admit that I too had forgotten about the banana. I’m not even sure why, but I probably went several years without buying a single one! It wasn’t on purpose, I was just distracted by other, more thrilling fruits I guess. I came back to the banana this summer though. I was trying to up my fruit and veggie intake and also on the lookout for new, easily digested foods to integrate into my pre-workout meals and snacks. The banana was my perfect solution, and I’ve been buying them weekly ever since. Below is why I like bananas, and hope you will too! – Bananas are portable and easy to eat. There are no messy seeds or juices and no utensils needed, making the banana a great on the go snack. They are also easy to shove in a bike jersey pocket! (Tip: consider pre-peeling the banana if your bike handling skills aren’t impeccable). – Bananas are easily digested and a good source of carbohydrate, making them a great food to consume immediately before and during exercise. They are a great alternative to gels, bars, and chews for athletes wanting to use real food instead of, or in addition to sport nutrition products. One medium banana provides about 30 grams of carbs, which is comparable to one gel. – Bananas are high in nutrition. Bananas are commonly known for being high potassium, but they are also great sources of vitamin B6, vitamin C, manganese, and fiber! – Bananas are cost effective. Typically costing less than $1/pound even for the organic kind, bananas aren’t gonna break the bank. It’s also nice that you can buy just a few at a time so that you don’t have to worry about them going bad before you get around to eating them. – Bananas may help with weight management. Bananas are high in resistant starch, a type of fiber that is not easily digested and is thought to promote feeling satiated and improve glycemic control (aka stabilize blood sugars). Some studies have linked diets high in resistant starch to lower body weight, but the jury is still out so don’t over do it with your banana intake. 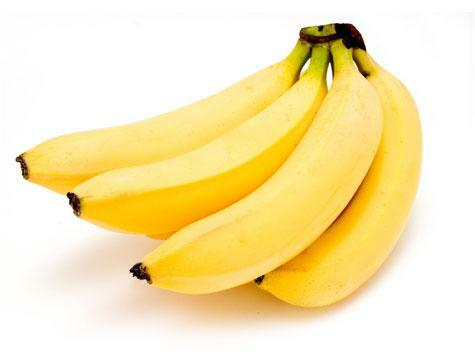 Eat your bananas uncooked to get the full benefits of resistant starch. Post workout: make a recovery smoothie by blending 8 oz low fat chocolate milk with 1 frozen banana. Dessert: slice a banana and fill the inside with a tablespoon or two of chocolate chips or bits of dark chocolate. Pop in the oven until the chocolate melts. Bonus points if you have a campfire to make this over! So you see, really bananas are an athlete’s best friend. Eat up! This entry was posted in General Health, Sports Nutrition and tagged bananas, Sports nutrition. Bookmark the permalink.